Today i am going to write about Online Marketing Automation Softwares. If you have an online business these automation software’s will help you to automate your sales process and thus improving your business profits and make scaling of your business easy. There are many tools online for marketing automation like Infusionsoft , Ontraport, Salesforce, MarketHero ( not launched yet) etc. These software’s help us automate the whole sales process. Yes i said that right , the whole sales process can be automated. You don’t have to do anything expect to sell your products and these software’s will automate the whole sales funnel once setup. You can create upsells , down sells. Send out action driven emails like when a customer purchases product 1 send them a recommendation email for product 2 which they might be interested in purchasing too. Like this there are thousands of automated processes you can do with these softwares. Imagine the power of such automation software’s which can track each customer and what they buy and how much each customer is worth. This can help you in making a decision how much you can invest on acquiring a lead and how much you can make out of a lead. I have mentioned the best Marketing Automation Softwares below. Ontraport, previously known as autopilot on the contrary, is easy to use than infusionsoft ( for me ). It has less bells and whistles than infusionsoft but it gets the job done. Check out Ontraport plans and pricing below.It starts at only 79$ and goes all the way up to 597$ for the Team Plan and they even have a custom plan if you wanted one.And each additional user costs 47$ / month. So if you have 10 users in your company who want to use the software then that alone would cost you 470$. Infusiosoft is the leading marketing software. It has tons of features which you can use to automate your business. But based on my experience with infusionsoft, it is not easy to use. You have to learn a lot of things before you can setup an automated process. Unlike Ontraport the number of users is included in the pricing of the Infusionsoft plans. That’s a good thing for you if you wanted more than 1 user to use Infusionsoft on your company. Check out Infusionsoft plans and pricing below. It starts at 199$ per month for its basic essentials plan and goes all the way up to 599$ for team plan. But that cost also includes the number of user’s, unlike Ontraport. Salesforce is one of the best choices but their plans are highly-priced than other marketing software’s out there. Marketo , Aweber ( only for email marketing automation ) are some alternatives you can try if you only wanted to automate the email marketing part of your online business. 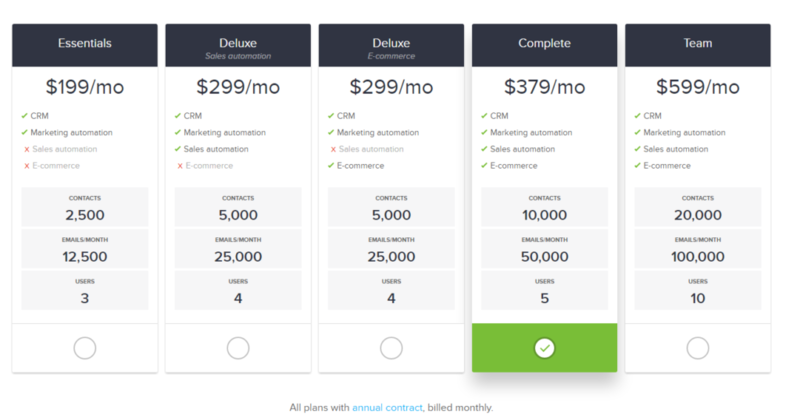 If you are still confused you can visit this Marketing automation software comparison website for a complete comparison. You can also read a full in-depth infusionsoft vs ontraport comparison here if you like, which helped me to choose my automation software easily without going through various sites. Hope you liked this article. Also let me know in the comments if you have any questions and which software you like.